Hello folks and my very best wishes to all. Why am I here? Well my parents really liked each other once upon a time ( https://www.wikihow.com/Talk-About-the-Birds-and-the-Bees ), this led to me been born and apparently the Nurses at the time thought I had been given a foreign name “Oh No” but was just my parents thinking out loud. I digress, I’m a very amateur but enthusiastic DJ? for RadioParkies.com which is a radio station run by people with Parkinson’s for people connected to PD whether you Wear, Care, Share and even Unaware with this condition. It was started in 2010 by Jean Paul De Cremer in Belgium and now also has DJ’s broadcasting from Australia, Brazil, Denmark, France, Germany, Holland, Iceland, USA and of course the UK. it broadcasts 24/7 with the Non Stop Jukebox playing when no DJ’s are on air. The station brings to you lots of informative news about PD in News, Research, Events both local and international and Health & Well Being. There are also many great interviews with people from around the world contending with the many aspects of this condition in either a personal or professional capacity. DJ Scazza of the UK conducted an interview with the CEO of Parkinson’s UK Steve Ford. There is also plenty of non PD items like Friendly Chat, Quizzes, Poetry both PD and Non PD, Song Requests, Dedications, Shout Outs, Listener Involvement. The music played is from many Genres of music and every Decade but predominately 60’s to 90’s. There are also songs from local Nationalities of the DJ’s so the station really does have something for everyone. The Non Stop Jukebox is always on when the DJ’s are off air and plays every and I mean every type of music for your audio pleasure. There are also occasional promo’s played from the DJ’s so you can get an essence of there shows. My own show is 8 pm - 10 pm every Saturday evening where I try to play a wide selection of tunes but my fave is Indie and Rock. I love to receive and air contributions of Poetry and have aired poems from Parkinson’s UK forum members Lin, Jules77, Tommy (T1), JonB13 and this Saturday 23/04/19 a poem by mike_700. I am more than happy to play requests, do dedications and shout outs as I have for Barbara. If you have something you’dd like to contribute just message me and i’ll do my very best as will all the DJ’s. 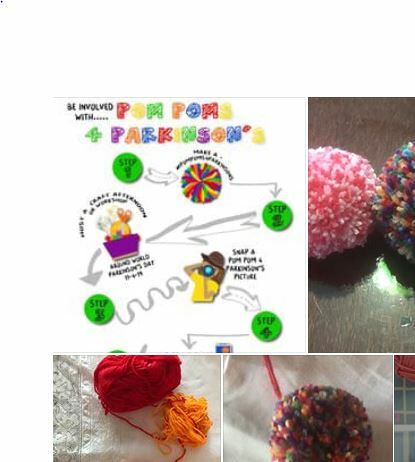 World Parkinson Awareness Day - Pom Poms 4 Parkinson’s, the basic concept is to make time to sit and chat whilst making pom-poms, to encourage social connections and have a bit of easy and simple fun. I believe creativity can be an antidote for apathy and a powerful affirmation. It’s mindful. Pom Poms can be symbolic - anyone can make a Pom Pom, just like anyone can get Pd. They are unique - like our symptoms. Pom Poms are small but together they have impact. Pom Poms are fun and we all need more fun. Host a big or small gathering on or near WPAD 11 April. Donate your precious Pom Poms to be displayed at my Creativity and Parkinson’s Poster 757 at the World Parkinson’s Congress in Kyoto 4-7 June. Make a Pom Pom and wear it with pride. and send to me on messenger for inclusion into a WAPD video. If anybody would like to make a short video as mentioned by DJ Madonna but doesn’t use FaceBook, please send me a message and will sort out emailing clip to me to forward on to Madonna (the DJ one). If you are a bit unsure about the recording and sending a video clip just let me know and I will help in whatever way possible. Thank you Babs, Have remastered it lol so Scoobyless and a couple more songs. It is my one year anniversary and doing 80’s n 90’s. Do you have a song you’d like to hear Bab’s from either decade. Let me know. If anyone else would like a song request from these let me know and i’ll play with a shout out to you. I look forward to hearing what you choose Babs. Hi JP I would like to choose the song Wake Me Up before you Go Go… Wham. Think it is too late to do verse as off to my sons. But lease send me instructions and I will suss it out for next week. My sincerest apologies as only just seen request of song choice so didn’t get chance to play live. I will play next week and will also have a surprise for you to hear. Hi Babs and hoping our foot is nearly recovered. Here is the method for recording and emailing on Android. Want to use your LG Android smartphone as an audio recording device? The LG V20 has a great app for the task - HD Audio Recorder - and here's how it works! 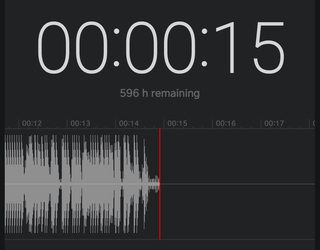 Your phone may have a different recording app but they are basically the same. Any questions email and will help out. If you do not have one you can download from Google Ply free. RadioParkies.com Poetry Competiton Winner Announced. Tune in and find out who won from RadioParkies very own DJ Scazza & DJ Phil. Well done to everyone who took part with some brilliant poems.